HARARE, Zimbabwe (NNPA) – With several low-key, but unmistakable gestures, the United States has signaled that it is moving toward normalizing relations with Zimbabwe, the former White minority-rule nation once known as Rhodesia. In March, former United Nations Ambassador Andrew Young was dispatched by the Obama administration to meet with President Robert Mugabe. After the 2-hour meeting, Young told reporters that the State Department had sent him to Zimbabwe to let Mugabe know the U.S. is interested in repairing its strained relations with the mineral-rich country of 13.1 million people. Zimbabwe, slightly larger than the state of Montana, is bordered by South Africa on the south, Zambia and Botswana on the west and Mozambique on the north and east. 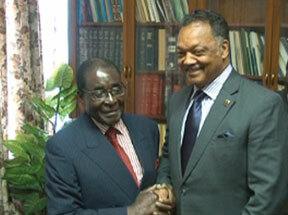 Last month, another civil rights veteran, Jesse L. Jackson, Sr., also held a 2-hour unofficial meeting with Mugabe in which the Chicago-based leader called for open and free elections and pledged to work for the removal of U.S. sanctions against Zimbabwe. After controversial land reform and what the U.S. called flawed elections, the United States applied limited sanctions in 2003 against about 120 key individuals and 70 industries. Unlike broad sanctions against Iran, the restrictions, including a travel ban to the U.S. except for UN business, are narrowly targeted. Earlier this month, the U.S. Treasury Department announced that it was lifting sanctions against the Agricultural Development Bank of Zimbabwe (Agribank) and the Infrastructure Development Bank of Zimbabwe, provided no transactions are conducted with any person who remains on the sanctions list. The U.S. action came on the heels of a decision in March by the 27-member European Union to remove sanctions against 81 officials and eight firms in Zimbabwe. The sanctions will remain in place against President Mugabe and 10 members of his inner circle as well as two firms. The EU’s action was announced after 95 percent of Zimbabwean voters approved a new constitution that limits a president to two, 5-year terms, includes a bill of rights, prohibits the president from vetoing laws passed by the legislature and establishes an independent electoral commission. The election changes are not retroactive and will not prohibit Mugabe, the only leader the country has had since gaining independence from Britain in 1980, from running again in the next election, which is expected to take place in August or September. The international community began withdrawing resources from Zimbabwe after the democratically-elected government decided to reclaim land from White commercial farmers, land that they said rightfully belonged to them. The western media trumpeted stories about how unfair the White farmers were being treated under the new Black government. However, Joseph M. Made, the former minister of lands, said the Black farmers were the ones aggrieved. “What is very critical is that 6,000 White commercial farmers controlled prime agricultural land – about 15 million hectors [36 million acres] – denying a majority of Blacks an opportunity to also be involved in agriculture in prime areas where there’s better rainfall and better soil,” said Made, who is now Minister of Agriculture, Mechanization and Irrigation Development. David Bruce Wharton, U.S. Ambassador to Zimbabwe, called the land reform effort a failure. Made said critics are ignoring Zimbabwe’s reality. Initially, Britain and the U.S. had agreed to compensate displaced White farmers as part of the 1979 Lancaster House Agreement that brought independence to what would later become Zimbabwe. Once the farmers were not paid, the blame was shifted to the Mugabe government, not the countries that reneged on their pledges. Made said most of the world minimizes the suffering Blacks experiences under White minority rule. Skyscrapers that dot downtown Harare are rusty reminders of a gleaming city of a bygone era. An automobile trip from the airport to center city is a bumpy one because of deep potholes. Even the sidewalks, now that Blacks can walk on them, are in desperate need of repair. President Mugabe said international sanctions have taken a toll on the country. But Ambassador Wharton said some of the wounds were self-inflicted.